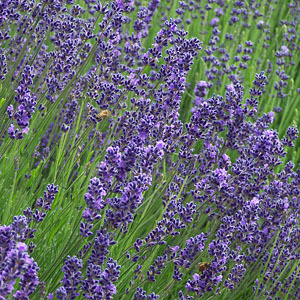 This English lavender cultivar was named for lavender expert Dr. Arthur Tucker. It blooms early and continues throughout the summer. It has nice stem length and color for fresh or dried flowers. Very popular in the Herb Society of America/Jackson County Master Gardeners display garden; Shown here by the garden sign. Nice all purpose cultivar for harvest and landscaping. Calyx color is dark purple; corolla is violet.